In the age of the instant image, it's difficult to imagine what a leap forward the original Polaroid camera represented when it hit the market in 1948. Capable of producing quick prints after a wrist shake that later inspired a hit record, the Polaroid was a big success, and by the Sixties, when the familiar 8x10 integral film was introduced, hundreds of millions were being sold every year. The digital era robbed the Polaroid of it's USP, and production of the film cartridges at the Netherlands plant wound down in 2008, but a group of enthusiasts are determined to not let it go quietly into that underexposed night. The Impossible Project is hoping to re-start production of the cartridges, and this Friday they're launching a worldwide campaign in conjunction with Urban Outfitters. Limited edition Polaroid kits with one specially preserved pack of 779 film and one 600 Polaroid camera will be launched at the Oxford Street store this Friday at 6pm, along with recovered Polaroid film. Urban Outfitters already sell image making equipment such as the Holga and Lomo ActionSampler — essential for your everyday hipster's wardrobe. They're hoping the rescued Polaroids will take off in a similar fashion. The Impossible Project hope that a worldwide renewal interest in Polaroid will help them re-start production next year. They're some way from realising it yet - their website has an open call for old Polaroid employees and engineers to help them solve some remaining technical difficulties. So if you know anything about latex timing layers, you know who to contact, and help the corpse of a photographic icon dust the dirt from its face and leap up out of the grave. 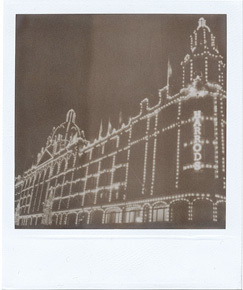 Saved Polaroid launch, at Urban Outfitters' Oxford Street store, Friday 21st August, 6pm.